Learn how to invite a new user in the Management Console. 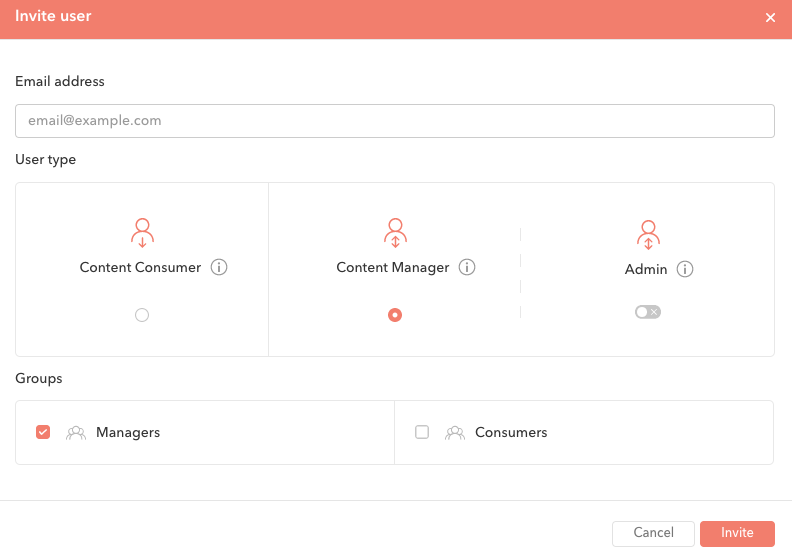 To invite users to your Swivle environment, open the Management Console and click the Users page in the navigation menu on the left hand side. Step 1. Click Invite user. The Invite User dialog appears. Step 2. Enter the email address of the user you want to invite. Step 3. Select the user type for the new user. The difference between the different user types is explained in this article. Note that during your trial, you are free to invite as many users as you'd like. However, after the trial ends, you are limited to the amount of subscriptions you have available. Step 5. Click Invite to invite the user. The user will receive an email from us with a link to activate their account.